Everyone knows not to tempt fate. Since the time of the Greeks we have been warned and warned against uttering that magical incantation “what’s the worst that can happen?” Doing so practically guarantees that the poor fool will find out exactly what that “worst” would be. 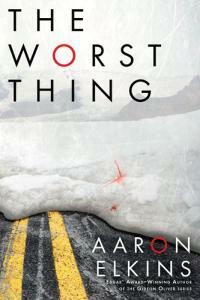 In his latest thriller, The Worst Thing, Edgar-award winner Aaron Elkins tests this theory against an interesting protagonist with decidedly mixed results. Bryan Bennett is a research fellow and expert in hostage negotiation and corporate security. He has literally written the book on the subject. But memories of his childhood experiences as a kidnapping victim trigger unexpected and potentially debilitating panic attacks, forcing him to walk gingerly around his deepest fears, never testing the limits of his resolve. Drawn to a training seminar in Reykjavik, Iceland with the hope of finally confronting and overcoming his panic attacks, Bryan finds himself drawn into his own worst case scenario. Once again taken hostage and with his life on the line, Bryan is forced to face his terror without the crutch of medication or the comfort of his loving wife. Throughout The Worst Thing, Elkins displays the skill of an experienced and award-winning author. Bryan’s first-person narrative provides insight into the psychological nature of panic and remembered trauma and Elkins adeptly makes his experience tangible for the reader. The writing is strong, the author maintaining a break-neck pace without sacrificing story or relying on those false cliffhangers that many lesser writers use to sustain interest. However, Elkins makes some critical missteps that ultimately undermine much of the suspense of the novel. Firstly, Bryan’s relatable-yet-acerbic wit ends up taking the sting out of several key scenes. Further, Elkins chooses to alternate the point of the view of the novel from first-person (with Bryan) to third-person (with everyone else), disrupting the flow of the story as well as the steady build-up of anxiety as the conflict progresses. Finally, the author indulges himself with a final twist that is largely unnecessary and ultimately renders all of Bryan’s previous struggles virtually meaningless. When the final page is turned, The Worst Thing can be termed an interesting book, but, unfortunately, not a particularly suspenseful one. Visit Aaron Elkins site here.